Hello, we are the Hadman family. Our beautiful daughter Effie was born in the summer of 2010 and was, at first, a perfectly healthy child. She met all of her milestones, even exceeding some of them. She loved to go to the local farm, run around at the park and play with her friends. In December 2012 when Effie was two-and-a-half, she seemed run down and anxious. We thought she may be coming down with a cold, but in reality it was much worse. 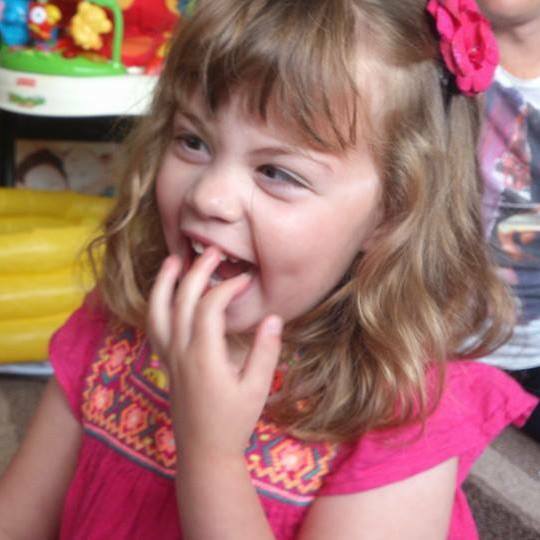 In January 2013, Effie had her first seizure – a drop attack in the bath. The following day saw three seizures, by the end of the week she was having ten a day and was admitted to hospital. Effie was diagnosed with epilepsy and started on seizure medication. Over the next six months, the seizures became increasingly difficult to control and her medication was regularly increased. Effie’s development slowed considerably over the following months. The day before her third birthday in June 2013, she was admitted to hospital again unable to walk, with slurred speech and hallucinating. More medication was added which seemed to help and she was able to walk again, albeit very wobbly with lots of falls. As the year progressed, Effie’s ability to walk and talk continued to decline and it was clear that she had started to forget things she had learnt. 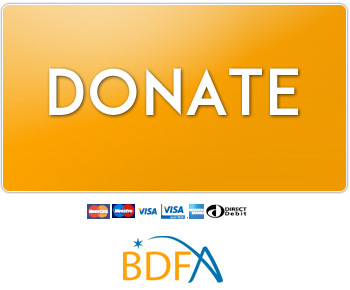 In January 2014 we were given the devastating news that Effie has Late Infantile Batten disease. Effie was just three-and-a-half years old. At this time her little brother George was 6 weeks old and we had an agonising wait to find out if he was affected too. Fortunately he doesn’t have Batten disease, which was a massive relief for the whole family. The months after diagnosis were a very dark time for us butwe have learnt not to look too far ahead and to focus on what Effie can and loves to do, rather than what she has lost. We are determined to get as many giggles every day, even on days when we don’t feel like smiling ourselves. People tell you to ‘make the most of every day’, which can be a difficult concept. It’s difficult to feel as though you’re making the most of precious time when you’re waiting around for appointments or exhausted from sleepless nights. We’ve learnt that memorable times don’t necessarily have to be spectacular trips out (although those are fab! ), but can be simply relaxing at home with the family or playing in the garden. Despite all the “Batten’s stuff”, Effie is still a fun-loving, rollercoaster-loving cheeky four year old who wants to have adventures. The difficult part is for us to judge when these days will go down well and when they’re going to cause meltdowns! Since diagnosis, we have been keen for Effie to experience as many different things as possible. Effie can no longer walk and is becoming more and more dependant but by concentrating on what she can do, we’ve found that Effie adores rollercoasters! It’s something we’d never have thought to go on previously, but we’re trying to make the most of Effie’s abilities while we can. We applied to the Make-A-Wish foundation to help us make some amazing memories with Effie and originally asked for a family holiday somewhere sunny. However, at the time Effie’s seizures weren’t well controlled and we were going through a difficult patch of hospital admissions and screaming sessions and felt that trips away were best planned last minute as we never knew what each day would hold in store. So instead we requested something Effie could use every day and which would bring the most enjoyment for the whole family. As Effie loves the feeling of moving and is a bit of an adrenaline junkie, we decided to ask for a bike for Effie so that she could go as fast as possible! 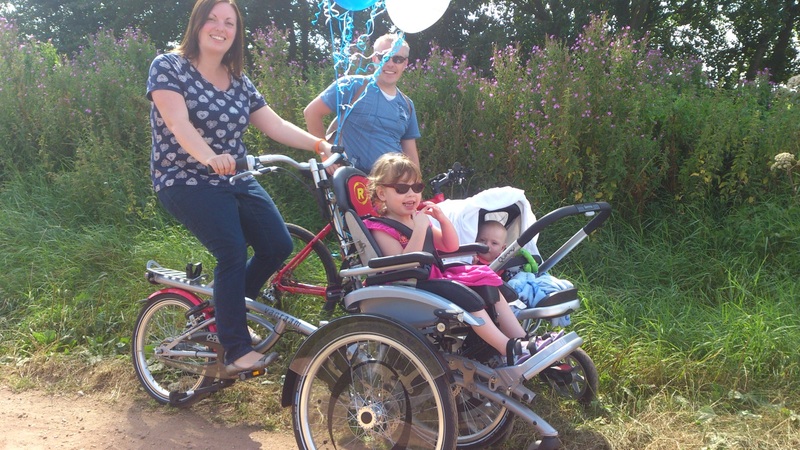 She cannot pedal herself and as the disease progresses, she will struggle to sit unaided so with this in mind, we requested a Van Raam O Pair, which is the most incredible bike ever! Effie sits in the (detachable) wheelchair section at the front and we pedal the bike attachment behind. It can be adapted to give head support when needed, although we try not to think that far ahead. It’s fair to say that the harder we pedal, the more giggles we get! It gives Paul and me valuable exercise whilst being out and about as a family. We can be outside with Effie getting fresh air and making the most of our time together.